From right, Tim Callahan, a staﬀ engineer in SwRI’s Powertrain Engineering Division, led the dual-fuel engine demonstration project. 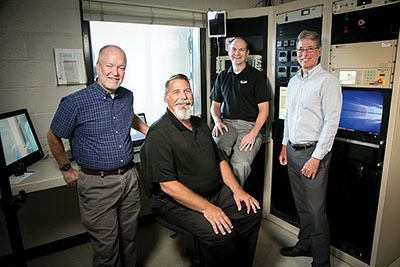 The project team included Ryan Johnson, manager of the Large Engine Development section, and David Meyers and David Branyon, staﬀ engineers specializing in powertrain development. The latest U.S. Environmental Protection Agency emissions standards for large off-road engines, known as Tier 4 Final (4f), are encouraging construction and agricultural equipment manufacturers to consider alternatives to the standard diesel engine. High-horsepower marine and locomotive manufacturers face similar challenges. Tier 4 compliant engines must reduce emissions of particulate matter (PM) and oxides of nitrogen (NOx) significantly. Compared to previous emissions standards, reductions would cut more than 95 percent of emissions for most agricultural and construction equipment and almost 90 percent for locomotives and marine vessels. The temptation was to follow the example set by the automotive and on-road truck industries, adding selective catalytic reduction (SCR) equipment to reduce NOx and/or diesel particulate filters (DPF) to reduce particulate matter. Alternately, some manufacturers are examining exhaust gas recirculation (EGR) combined with DPF for NOx and particulate control. However, aftertreatment systems and engine modifications both require complex control systems and pose difficulties in fitting the systems into existing vehicle designs and then maintaining them in-service. There is a third alternative, one that originally looked appealing for its economics rather than its environmental benefits. During a time of price disparity between low-cost natural gas and more expensive diesel fuel, some off-road manufacturers became interested in dual-fuel engines that run on natural gas in combination with diesel. These compression- ignition engines mix natural gas in the inlet air stream with a small amount of injected diesel fuel for ignition. During that period, Southwest Research Institute (SwRI) engineers developed large dual-fuel engines for mine haul trucks. The SwRI-designed high-horsepower off-road engines demonstrated that well- engineered dual-fuel engines could easily meet the prior EPA Tier 2 regulations. With that result, SwRI engineers began investigating using dual-fuel engine designs to potentially meet Tier 4f without the need for catalysts, exhaust gas recirculation, or particulate filters. 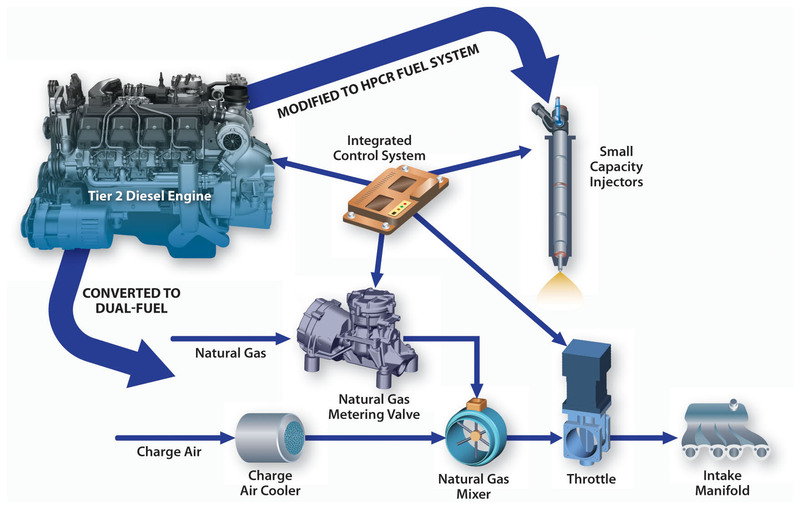 The goal was to design and demonstrate a dual-fuel engine that would reduce or eliminate the aftertreatment packaging issue while reducing the product and operating costs associated with adding these systems. The technologies not only add to the initial cost of the vehicles but also can increase fuel consumption, reduce engine performance, and add costs to operate and maintain the equipment. Dual-fuel engines typically rely on conventional diesel engine hardware modified to operate with natural gas. Under dual-fuel operation, natural gas is introduced at low pressure and mixed with the intake air. Diesel fuel is injected directly into the combustion chamber near the end of the compression stroke to ignite a lean mixture of natural gas and air, using compression ignition. An SwRI team explored modifying a Tier 2 diesel engine for dual-fuel operations to cost-eﬀectively meet the latest emissions standards. The team integrated a high pressure common rail (HPCR) diesel fuel injection system and natural gas control valves, mixers, and throttle into the non-road HD engine. An integrated control system tunes the new dual-fuel technology to meet the EPA’s latest engine emissions standards. “Tailpipe” emission standards specify the maximum amount of pollutants allowed in vehicle exhaust gases. Today, emissions from internal combustion engines are regulated throughout the world. The regulated diesel emissions include diesel PM, NOx, hydrocarbons (HC), and carbon monoxide (CO). Trying to meet Tier 4f regulations using conventional techniques requires aftertreatment with “active control” SCR and DPF for compliance. SCR requires injection of diesel exhaust fluid (DEF), a urea/water mixture that reduces NOx in exhaust that contains oxygen. The fluid itself is often more expensive than diesel fuel and must be replenished periodically. 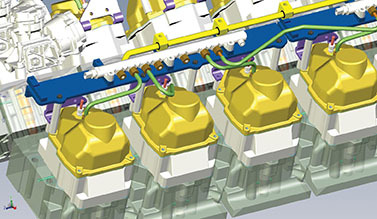 An alternative to SCR is cooled EGR, which works to reduce NOx in-cylinder. But this can decrease fuel conversion efficiency and has its own issues related to packaging, durability, and reliability. Adding a filter to capture particulates requires active regeneration to periodically oxidize the captured PM, as well as periodic ash removal. Currently, the primary paths to Tier 4f are SCR only, SCR + DPF, or EGR + DPF. Each of these solutions leads to mobile packaging difficulties, increases initial and operating costs, and introduces durability, reliability, and maintenance concerns. To explore a cost-effective solution to the current regulatory environment, the SwRI team adapted a Tier 2 non-road diesel engine for this demonstration project. The engine was converted for dual-fuel operation and optimized to achieve Tier 4f emission levels. SwRI optimized diesel injection timing and pressure, the gas/diesel substitution ratio, and air-fuel ratio to meet the emissions standards while still providing stable, knock-free operation. The project aimed to reach Tier 4f without EGR or active aftertreatment, and to do so while burning a very high percentage of natural gas, even at moderate to low speeds and loads. Instead of taking advantage of lower natural gas prices, currently the best incentive for dual-fuel lies in its ability to meet today’s lower emissions standards for large engines cost-effectively. 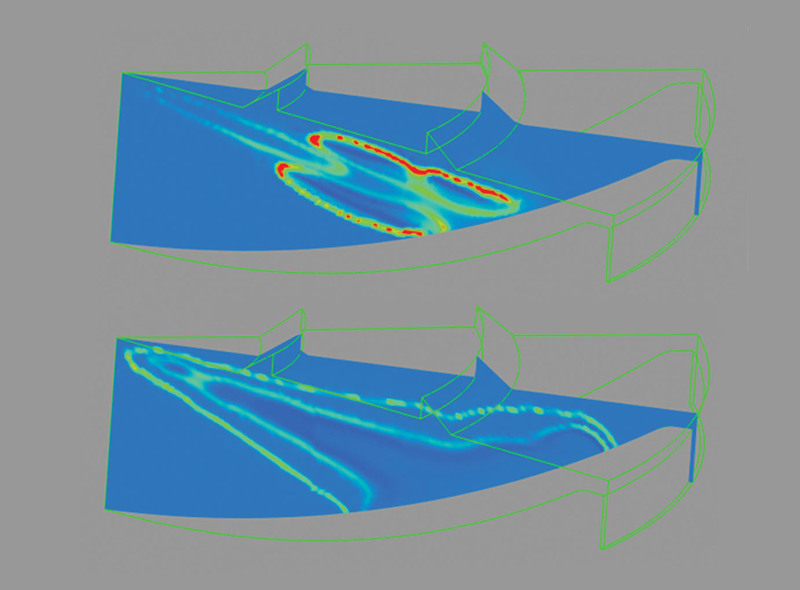 SwRI frequently uses computational ﬂuid dynamics to understand the dual-fuel combustion process. Frame A shows the initial diesel ignition, while Frame B shows later diﬀusion burning of the diesel plume inside, with natural gas ﬂame front on the outer edges. Another goal for dual-fuel engines is to achieve the highest substitution ratio, or percent of natural gas that replaces diesel fuel. To date, this ratio is typically limited by an engine’s ability to accurately and consistently inject very small quantities of diesel. Knocking, erratic combustion that can cause engine damage, also limits substitution ratios. This phenomenon, occurring under high-load conditions when substitution ratios and in-cylinder temperatures are high, is typically avoided by operating on diesel fuel only when providing full power output. Low to moderate loads present an alternate problem with poor combustion of very lean air-fuel mixtures. As a result, existing dual-fuel engines typically revert to 100 percent diesel below about 50 percent load and at low engine speeds. The SwRI-modified test engine featured both an inlet air throttle and a reduced-flow, high-pressure common rail fuel system. These two features facilitate natural gas usage in the low-speed and -load region, while maximizing substitution throughout the engine’s operating range. Typical dual-fuel engines reach peak ratios of 80 to 90 percent natural gas, and a duty cycle average of 40 to 75 percent. The goal for this project was to increase the duty cycle average to at least 90 percent with peak ratios of 95 plus percent substitution. To improve combustion and minimize emissions, the SwRI team outfitted its test engine with a smaller-capacity diesel fuel injection system, using low-cost injectors with increased flow tips from a light truck engine. Modified valve covers allowed high-pressure fuel line access to the injector. Two injection pumps and four fuel rails facilitated fuel injection. Minimal intrusion on the original design and the use of commercial, off-the-shelf parts whenever possible reduced the cost of parts and engineering, minimizing changes to the base engine. This strategy also controlled durability and reliability risks. Natural gas metering valves and mixers were added downstream from the turbochargers. A throttle just down-stream of the mixers controlled the air-fuel ratios. In internal combustion engines, the air-fuel ratio is critical for controlling pollution and tuning performance. If the air-fuel ratio completely burns all of the fuel, consuming all available oxygen, the ratio is considered stoichiometric or the exact proportion needed for combustion. Ratios lower than stoichiometric are “rich.” Rich mixtures are less efficient, resulting in incomplete combustion due to lack of oxygen. Ratios higher than stoichiometric are “lean.” Optimized lean mixtures are more efficient, producing low NOx, but improper control of lean air-fuel ratios can lead to misfire, or poor combustion, with high levels of CO and HC exhaust emissions. In the quest for Tier 4f, engineers programmed an integrated control unit to govern the diesel fuel injection event, natural gas metering, and throttling. State-of-the-art metering valves and close-coupled gas addition systems provided precise, near-real-time control of gas flow. The engine was fully instrumented to measure temperatures and pressures. The team used a cylinder pressure transducer on each cylinder to monitor combustion, measured diesel and natural gas fuel flow, and characterized exhaust emissions. Non-road applications require engines to operate over a wide range of speed and load conditions. The SwRI team adjusted the natural gas substitution rate, diesel injection timing and pressure, and air-fuel ratios to optimize operations over a range of speed and load combinations. This also provided the best trade-off between NOx and CO. At some operating points, an intake air throttle reduced the air flow to reduce the overall air-fuel ratio, minimizing CO and unburned hydrocarbons while keeping NOx below the regulated value. The emission test cycle for this class of engine is the ISO 8178-C1 weighted 8-mode test. SwRI’s test matrix for dual-fuel optimization included six of the eight test conditions, which account for approximately 96 percent of engine emissions. The other two modes measure emissions at 10 percent power and low idle, where dual-fuel operation is not feasible. Instead, the team used the base diesel mode to supply emissions data for those points in the cycle. The SwRI engineers added another evaluation point: 900 rpm at 50 percent load. Dual-fuel engines typically struggle to utilize a significant amount of natural gas at this point, so the engineers hoped to demonstrate the engine’s improved capabilities in that range. SwRI engineers outﬁtted the dual-fuel demonstration engine with a reduced-capacity, high-pressure common rail diesel fuel system to accommodate high natural gas substitution rates. Recently the EPA went from exempting only methane from hydrocarbon emissions subject to regulation, to exempting both methane and ethane. This shift, which lowers the net exhaust under regulation, means that dual-fuel engines may not even require a catalyst to meet Tier 4f. If needed, a passive oxidation catalyst, which is simpler and less expensive than an active catalyst system, should suffice. The SwRI evaluations measured non- methane-only emissions, with the knowledge that meeting those criteria are more difficult than the newer EPA specs. The SwRI engineers optimized the test engine’s operating parameters at each test point to meet the desired Tier 4f emission targets. The focus was on optimizing the NOx/CO tradeoff while achieving the highest engine efficiency. The CO levels were well below the standards at all timings, indicating good combustion. Although non-methane, non-ethane emissions were above the regulated value, results showed good potential to reach the regulation with additional development and no oxidation catalyst. Significantly, the entire set of data was collected at 97 percent substitution ratio. This high ratio maximizes the use of natural gas, which could accelerate payback when natural gas prices fall below those of diesel. Work continues on refining the dual-fuel concept as a solution for Tier 4f emission standards. Dual-fuel engine technology, initially developed for fuel cost savings, could now offer an even larger incentive by avoiding expensive and unnecessary aftertreatment systems while delivering superior efficiency and 4f emissions compliance. Questions about this article? Contact Tim Callahan at 210.522.6890.